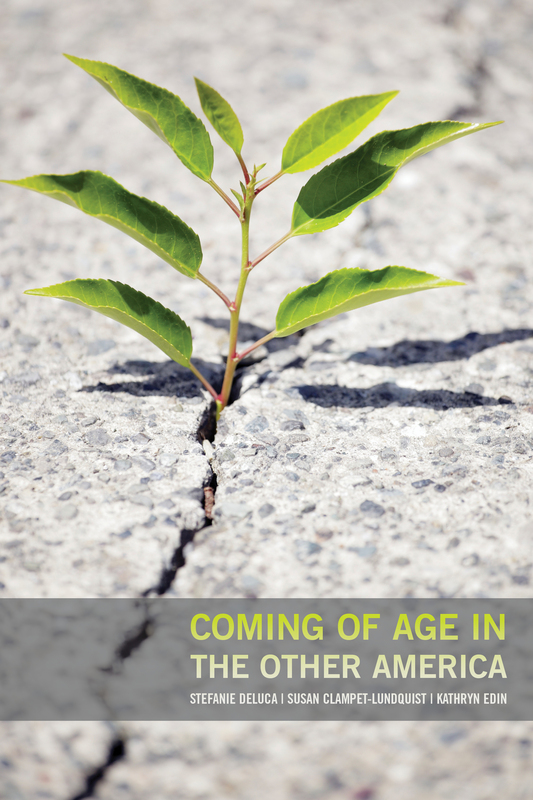 In a new book published today by the Russell Sage Foundation, Coming of Age in the Other America, Stefanie DeLuca, Susan Clampet-Lundquist, and Kathryn Edin explore how some disadvantaged urban youth manage to achieve upward mobility despite overwhelming odds. Based on over a decade of the authors’ original fieldwork with parents and children in Baltimore, the book illuminates the profound effects of neighborhoods on impoverished families and shows how the right public policies can help break the cycle of disadvantage. Several news articles have already cited research from the book, including a profile in the Atlantic which outlines the authors’ study in detail, including how they interviewed 150 young adults and tracked “how those kids had fared in various areas between 2003 and 2012, including education, employment, family status, mental, and physical health and risk behaviors.” In their research, the authors found that youth who had been able to move to better neighborhoods—either as part of the Moving to Opportunity program or by other means—achieved much higher rates of high school completion and college enrollment than their parents. In an interview with Marketwatch, DeLuca states, “What we saw most of these young people doing at the brink of adulthood was going to school, working, combining the two. The majority of these youth were engaged in mainstream institutions like school or work and this was particularly the case for those with identity project.” An “identity project”—or a strong passion such as music, art, or a dream job—motivated about half the youth surveyed to finish school and build a career. Yet the authors also found troubling evidence that some of the most promising young adults fell short of their goals and remained mired in poverty. As the Atlantic puts it, “Students whose parents are absent, who are living in overcrowded homes, who are surrounded by crime and blight, often struggled in adolescence despite early promise and despite being passionate about their hobbies.” And in interviews with the Nation and Rising Up with Sonali (video below), DeLuca emphasizes the importance of neighborhood quality in determining life outcomes. “It’s not just the family you grow up in that determines your fate, it’s your neighborhood as well,” she says. Click here to read more about Coming of Age in the Other America or purchase a copy of the book.